When you look at the events leading up to WWI, it seems odd that so much of the conflict focused on the stalemate along the Western Front (and to a lesser extent, the Eastern Front along the Russo-German border). For most of the late nineteenth century, the Great Powers squabbled over control of Africa, Asia, and the Balkans, with attempts to woo the Ottoman Empire to either side. In fact, when Archduke Franz Ferdinand was assassinated in Sarajevo, many assumed the battle would be short and decisive and only between Austria-Hungary and Serbia. When the guns of August boomed, ushering everyone into battle, the initial objective of Germany was merely to overtake France before turning to Russia–no non-European territories involved (granted, the Congo Act of 1885 called for overseas possessions to remain neutral, but you get the point). Nevertheless, this was truly a World War, and not only were colonial troops drawn from their countries to fight along the Western Front, but practically every corner of the earth battled for supremacy. When the Ottoman Empire called for a military jihad against France, Russia and Great Britain in November 1914, the Allies were drawn into a major battle for their territories and interests in the Middle East. 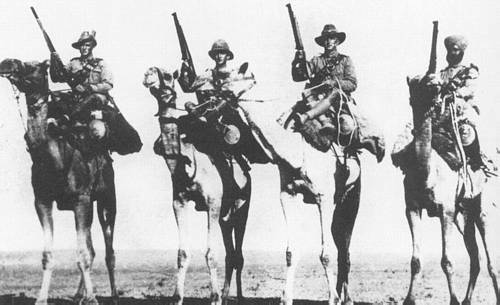 There were five main campaigns–Sinai and Palestine, the Mesopotamian, the Caucasus, the Persian, and the Gallipoli–the last of which was the first major battle for the ANZAC troops, and was overall a disastrous failure for the Allies. However, as the Western Front hunkered down into its trenches, many politicians, including Winston Churchill, were adamant that it was the Middle East (or to be more specific, the Dardanelles) in which decisive victory lay. Churchill’s political career was shaken by the slaughter at Gallipoli, as was the Premiership of H.H. Asquith, who barely held onto his position by forming a Coalition Government with the Conservatives in late 1915 until he was finally ousted by Lloyd George in December 1916. Yet many remained convinced of the importance of victory in the Middle East, especially after the Arab Revolt against Ottoman rule in 1916 that was cultivated by Gertrude Bell and T. E. Lawrence. Life in the Middle East may have seemed like a picnic compared to the carnage of trench warfare, but soldiers had to deal with deathly heat, sandstorms, impregnable terrain, hostile “natives”, and long, arduous treks across the desert. Battles were perilous and dangerous, and hunger could be more feared than bullets. For the Allies, war in the Middle East was mostly futile and embarrassing, particularly the 147 day siege of Kut-al-Amara, where 23,000 Allied soldiers were either killed or wounded in an attempt to relieve the British and Indian troops besieged at the garrison. When the siege ended in with British surrender in April 1916, the 13,000 starved and exhausted soldiers were taken into captivity by the Ottomans (it is reported that “70% of the British and 50% of the Indian troops died of disease or at the hands of the Ottoman guards during captivity”). In the meantime, the primary objective of the Allies was the capture of Baghdad and of Jerusalem. Both occurred in 1917 as the Ottoman forces were exhausted by campaigns on all sides and as the Germans turned more and more of their attention on defeating the Allies on the Western Front (particularly after America entered the war). The battle for the Middle East raged on until October 30, 1918, when the Ottomans and the Allies signed the Armistice of Mudros. In the aftermath of the Great War, the Arab revolt, the rise of the Armenians, and the final collapse of the Osmanli Dynasty created a conundrum for the European Powers. They had overthrown the Ottoman Empire with the help of various independent factions, but they still wanted control of the area. As a result, the hand of the Allies in the creation of the modern Arab world and the Republic of Turkey was heavy, and inadvertently set the stage for conflicts in the Middle East that exist to this day. After many years living or visiting in Israel, I accidentally discovered the British Imperial War Cemetery in Jerusalem. It was beautifully designed and is very well cared for. But even more interesting was the elderly Israeli man I met in 1966. He had photos on his walls of British Empire soldiers riding through the streets of Jerusalem, taken in 1917-8 when he was just a lad. Fascinating article !! Extremely relevant for the present times.